In these days when there is a strong movement afoot without the fold to restore the unity of the Christian Faith, we can indulge the hope that the four lectures of the distinguished abbot will prove fruitful. They are on subjects so vital to unity, i.e., the supremacy of the pope, the sacrifice of the Mass, the eternal priesthood, the universal Church. We pray that these sermons will attract the attention of many outside the Church, and make them meditate on the bitterness of breaking from their “Father's House”. May God's holy grace prove stronger than prejudice, as it has so often in the past, and may it soften the hearts which have been hardened by cruel legislation rather than by wilfull disobedience. The Right Rev. Francis Aidan Gasquet, Abbot-General of the English Benedictines and Chairman of the Commission appointed for the revision of the Vulgate or Latin Bible, gave a course of sermons at the High Mass in St. Patrick's Cathedral on the Sundays of Advent, 1913, on “Catholic Principles Abandoned at the Reformation”. These sermons attracted very wide attention. The subject chosen, while seemingly a familiar one, proved most interesting to the vast congregations, drawn by the fame of the preacher as an historian of the Reformation period. His manner of treatment had much to do with the profound interest manifested by his listeners. All attempt at pulpit oratory was cast aside, and the preacher confined himself to a clear unvarnished tale of the causes that led up to the so-called Reformation. He showed himself a complete master of the question. As announced in his opening sermon, the Rt. Rev. Abbot did not seek to be controversial, but purely historical, and this purpose he followed to the end, basing all his statements on documents whose authenticity could not be called into question. He made clear what Cardinal Manning has so often repeated, that England did not give up the Catholic Faith of centuries, but was simply robbed of it. It was my pleasure to be present at all the sermons, and to be held under the spell of his simple eloquence, and to experience the appeal his strong arguments must have made. The main thesis which the learned abbot sought to establish was that the doctrines of the Church in England had been reconstructed under Lutheran and Calvinistic influence, and the central beliefs held by the Church from the time of Christ had been rejected. This was especially true of the priesthood. By Act of Parliament, a new form of ordination, carefully and systematically excluding every word that could be interpreted to mean that the candidate was to be a sacrificing priest, was introduced. In these days when there is a strong movement afoot without the fold to restore the unity of the Christian Faith, we can indulge the hope that the four lectures of the distinguished abbot will prove fruitful. They are on subjects so vital to unity, i.e., the supremacy of the pope, the sacrifice of the Mass, the eternal priesthood, the universal Church. We pray that these sermons will attract the attention of many outside the Church, and make them meditate on the bitterness of breaking from their “Father's House”. May God's holy grace prove stronger than prejudice, as it has so often in the past, and may it soften the hearts which have been hardened by cruel legislation rather than by wilful disobedience. Last Sunday I spoke of the Catholic doctrine of the Mass and the Holy Eucharist. I pointed out what our Faith taught us about the Blessed Sacrament and how the Mass was to our Catholic forefathers, and is to us today, the central act of our worship of God; and that the Holy Communion, in a very true sense, is the food of our spiritual life, as it binds us to God and brings Him into our lives in truth and in reality, which is the end and object of every act of religion. 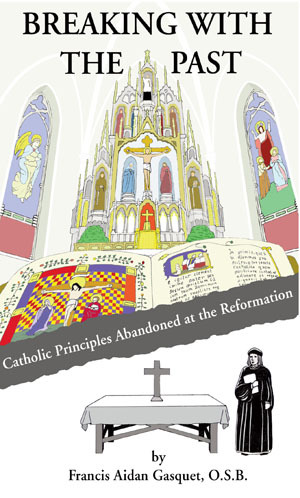 I pointed out to you that by the principles of the Reformation, adopted by the followers of the Lutheran theology in England, the Mass, as a “sacrifice and oblation”, was not merely attacked doctrinally, and spoken of by the men of the “new learning” with scurrilous profanity, but destroyed altogether, as far as it was possible for them to do. The service of Communion in the new Book of Common Prayer, designed to take the place of the ancient missals, was drawn up in such a way as to get rid of every expression of the Catholic doctrine as to the sacrifice of the Mass, absolutely. If the old dictum lex orandi est lex credendi—prayer follows belief—has any application at all, it must be obvious in this case that the authors of the new English Prayer Book had completely rejected the Catholic belief as to the Most Holy Sacrament. The proof lies not in the new forms only when compared with the old, but in the clear and definite statements of those who had the main share in drawing up the communion service of the Book of Common Prayer and the chief part in imposing its acceptance upon the people of England. I know well that in comparatively late times one school of thought in the English Church has endeavored to get back to the old Catholic doctrine of the sacrifice of the Mass. Some have been so dissatisfied with the formula of the communion in the Book of Common Prayer that they have added to it and have even in some cases made use of our ancient Canon from the Latin missal. In other instances, as in the communion service in the American Church, a longer Canon had been adopted, taken from the First Prayer Book of 1549 and arranged differently from that of the Second Book now in use in England. But the doctrine in this is in no sense our Catholic doctrine. For, although the words “sacrifice” and “oblation” may be found in it, as indeed in the Anglican prototype, the word signifies not the Catholic sacrifice, the offering up of the Body and Blood of our Lord as a living victim upon the altar, but as the words in the Communion office define it, “our sacrifice of praise and thanksgiving”, in which “we offer and present ourselves, our souls and bodies, to be a reasonable, holy and living sacrifice unto thee”. Mind, for my present purpose, I am not here contending that the work of the Reformers in the 16th century in thus composing a new formula was wrong. All I would insist upon is that this was in fact done; that certain ancient Catholic principles were abandoned in the new Communion Service, and that this new book by the authority of the State was imposed upon the consciences of all. That the change thus forcibly effected was disliked very generally cannot be doubted. The new service was ordered to come into general use in the churches on Whitsunday, 1549, and, the very next day, the people of Stamford Courtenay in Devon compelled their parish priest to return to the old missal. This was but an indication of the spirit of the people and a beginning of those numerous disturbances in various parts of the country which for a time seriously alarmed the men in power. In Oxfordshire, the rising was put down with a firm hand and many priests were hanged from the towers of their parish churches, as the obvious leaders of their people to resist these innovations. In Devonshire, the rising took a more serious aspect and the people assembled in their thousands de-manding the restoration of the Latin Mass and the abolition of the new service in English, which they described as “a Christmas game”. “We will have”, they said, “the Mass as of old and the Blessed Sacrament hanging in our churches”; and to show the religious character of their revolt against the State-imposition of the new form of religion, the insurgents carried the Most Holy Sacrament in a pyx in their midst, and marched with processional crosses and banners. By the aid of foreign mercenaries—German and Italian—they were defeated, and thousands—some say twenty thousand—of the men who rose in defence of the Catholic doctrine of the Mass were slaughtered. We have now to go a step farther in our contrast of our Catholic belief with the Reformation principles. This morning I propose to speak of the sacred priesthood. The Catholic doctrine of the sacrifice of the Mass imples a sacrificing priesthood. To us a priest, in the first place, is a man chosen, set aside and consecrated for the service of the altar. He is a man and, alas! sometimes, in spite of the dignity of his calling, he shows himself to be very human; but by the vocation of God that is given to him and by his ordination at the hands of the bishop he receives a character which nothing can take away and which enables him to stand before the altar and offer the Christian sacrifice. At his word, spoken by the power God has given him, he changes the elements of bread and wine into the true and real Body and Blood of Christ, and offers them to God as a sacrifice for the living and the dead. This is the Catholic belief as to the priesthood, and it has been the belief of Catholics from the earliest ages. I am not concerned to prove this, but merely state it as a part of our belief. As might be expected, the doctrine is set forth clearly in the form of ordination, to be found in the ancient pontificals, or books, containing those forms, which today are practically the same as those used in England in the sixteenth century. If we take the rite of ordination to the priesthood we shall immediately note, in the address of admonition to the candidates, that the bishop speaks of the purity of life necessary for those “who celebrate Mass and consecrate the Body and Blood of Christ”; whose hands are anointed “that they may know that they receive the grace of Consecrating”; and who receive the chalice and paten to show “they receive the power of offering sacrifices pleasing to God, since it belongs to them to consecrate the sacrament of the Body and Blood of the Lord on God's altar”. The candidate is likewise reminded of the excellence of the priestly office by virtue of which the Passion of Christ is daily celebrated on the altar. In the course of the rite, the priest's hands are blessed since he is to consecrate the sacrifice offered for the sins and offences of the people; and he is given the chalice, etc., to show forth and emphasise the power to offer sacrifice and celebrate the Mass; and in the final blessing, God is asked to bless the newly ordained in the priestly order who is to offer sacrifices pleasing to Him. In a word, the whole ordination service in the Catholic pontifical reiterates and most emphatically states the fact that the priest is ordained to offer up the sacrifice of the Body and Blood of Christ upon the altar. This is the dominant note running through the entire rite: the ordained is made a “sacrificing priest”. Towards the close of the ceremony, and after the new priest has acted as such by co-consecrating with the bishop at Mass, the bishop gives him the power of jurisdiction by placing his hands upon his head saying: “Receive the Holy Ghost: whose sins ye shall forgive they are forgiven”, etc. This was the rite of ordination to the priesthood which was in existence in England at the time when the First Prayer Book of Edward VI was imposed on the English clergy and people. On the face of it there could be no possibility of allowing this old ordination service to stand as it was. The Mass had been changed into a communion service, a memorial of Christ's Passion, and the doctrinal teaching of the former had been made, rightly or wrongly, to give place to the Reformed principles clearly expressed in the latter. The notion of oblation and sacrifice was now wholly foreign to the eucharistic teaching, as understood by the followers of the Lutheran German reformed religion, who had presided over the composition of the new prayer book. It became, therefore, necessary to draw up another form for the ordination of ministers, conceived on the same doctrinal basis as that of the Book of Common Prayer. This new ordinal was in fact already prepared when the prayer book was issued and, on January 5, 1550, a bill to sanction it was introduced into the House of Peers. It gave rise to much discussion, and for refusing to assent to it one of the bishops was lodged in the prison where others of the Catholic-minded prelates were already confined. The “new form and manner of making and consecrating archbishops, bishops, priests, and deacons” was, however, approved of by Parliament in anticipation and ordered to be ready for April 1. The new ordinal did, in regard to the ancient Catholic pontifical, what the communion service had done for the missal. Having first swept away all the minor orders and the subdiaconate, the new form carefully and systematically excluded every word that could be interpreted to mean that the candidate was ordained to be a sacrificing priest. For the most part the new rite was a new composition, drawn up to meet the doctrinal views as to the Holy Eucharist of the English Reformers of advanced Lutheran principles. One of the few passages of the pontifical preserved in the ordinal were the words, "Receive the Holy Ghost: whose sins ye shall forgive”, etc., which accompanied the imposition of hands after the ordination in the ancient rite and conferred “the power of the keys.” In the new rite, this subordinate form became the substantial form of the new ordination service, although in it there was for a hundred years, until 1662, no mention of the order conferred. There can be hardly any doubt that this omission came about by the adoption of the old form by the compilers of the new ordinal. In the case of the Catholic pontifical, no such specific mention was called for, as when used in that to convey jurisdiction, the priest was already ordained and had co-celebrated with the bishop. Once more I repeat that I am not here concerned with any discussion as to whether the new ordinal was better or worse than the ancient pontifical. I desire merely to bring out the facts and to make it clear that the service of holy communion in the Book of Common Prayer and the ordination service in a doctrinal point of view go together. They are the expression of a change, of a serious organic change from the ancient teachings of the Faith, as expressed in the missal and pontifical. The prayer book and the ordinal of Edward VI were the serious expression of the deliberate alteration in the eucharistic teachings of the official heads of the Church in England at this time. They constituted a break, clear, sharp and decisive with the past. There can be no doubt of this in view of the facts. The change may have been for good or for ill, but it can hardly be denied that it was made, and made not by accident but of set purpose. It was a deliberate breach in the continuity of teaching as to the Holy Eucharist and the sacrifice of the Mass, which had existed in the Church in England from the earliest days of Christianity and the new teaching found its expression in the new formularies. Beyond this, the altar-stones, which by solemn rites and the unction of holy oil, had been consecrated to God for the Sacrifice of the Mass, and upon which the Body and Blood of Christ had been offered daily for the living and the dead, were not only pulled down, cast out of the church and defaced, but were out of derision and contempt set in the floor or the doorway that the passer-by might tread them under foot; or were turned to other still more debased uses. To us Catholics, the consecrated altar, with its relics of the saints and the memories of its hallowed consecration, is the most sacred thing, set apart to God's service, together with the chalice and the paten in which, and upon which, the mystery of the sacramental renewal of Christ's Passion is effected by the words of the priest. It was this hallowed stone which was treated with disdain and dishonor. To those who would have us think that the whole of the changes made at the time of the Reformation were mere protests against what they please to call the abuse of the Mass, in the multiplication of Masses for the living and the dead, the fact of the contemptuous and wholesale destruction of the ancient altars and the substitution of a moveable table, should be sufficient to show that it was no abuse that was thought of, or aimed at, but the abolition of the sacrifice altogether. But there were other indications that this abolition of the Mass and priesthood was the set policy of the men in power at this time. A more advanced Calvinist than even Ridley, urged the party forward on the downgrade of Catholic doctrine. In 1550, John Looper was offered the bishopric of Gloucester, but refused it, partly because of the mention of saints in the new ordinal, but mainly because of the vestments, which he would be called upon to wear and which he regarded as Aaronic abominations. “You have got rid of the Mass,” he said, “then rid yourselves of the feathers of the Mass also.” Later, however, when in doctrinal principle Cranmer and others had advanced further in the direction of Calvin, Looper was consecrated according to the new ordinal on his own terms. The Mass was gone; the priesthood had passed away; the altars were pulled down in the sanctuaries; the consecrated stones were broken and dishonored, and why should not the vestments—Aaronic abominations—indicative of the sacrificial character of the priest be dispensed with also? The time was propitious for Cranmer to take measures for the final destruction of the old order. Since the imposition of the First Book of Common Prayer, he had had time to grow out of his previous Lutheranism and had come under the spell of Calvin and his adherents in Geneva. The Reformer had written to Cranmer a personal letter urging him to be more active and hasten on the movement of Reform. The Archbishop of Canterbury had replied, begging Calvin to ply King Edward with letters urging him to eradicate the last vestiges of the old superstition. This was the spirit which presided at the composition of the Second Book of Edward VI. It was issued in 1552 and, before this, commissions were dispatched throughout the country to seize, in the king's name, all church plate and vestments. I have already spoken a word about this final recension of the liturgy of Edward VI. It is here sufficient to say that it was Calvinistic in its conception and doctrine. In the First Prayer Book there was some slight outward resemblance to the Mass. This was swept away and, to use the expression of one who lived at the time, this new liturgy “had made a very hay of the Mass”. Of the ancient Canon, which the Apostolic See had possessed from the earliest ages and had kept inviolate, nothing was allowed to survive, even as to form. Great popes like St. Leo and St. Gregory had inserted a few words into this inheritance of the Church with fear and reverence. Such men would have considered it sacrilegious and impious to alter or reject any part of it. Cranmer and his followers felt no such scruples. They first mutilated it and altered it to their heart's content and finally got rid of nearly every word of it altogether. The outcome of their work may be studied in the Anglican Book of Common Prayer today, where the communion service is substantially that of the book of 1552.